This walkthrough may not be sold and may not be used for any commercial purposes. 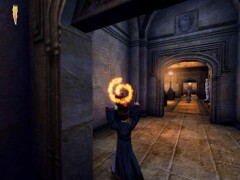 Neither is it permitted to publish this walkthrough in any way without the written permission of the author. 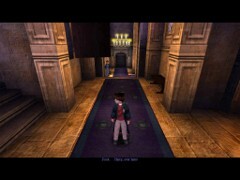 Feel free to place this walkthrough on your web site or on your home page, on condition that no part of this walkthrough is changed and that the name of the author (Dr. Hugh), the URL of the owner of this site ( www.gamesover.com ) and his E-mail address ( gamesover@planet.nl ) are mentioned unchanged. 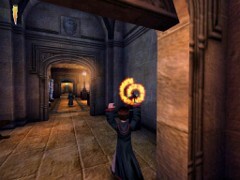 For the most up to date walkthroughs always visit www.gamesover.com. If you have any suggestions to improve this walkthrough, let me know by sending me an email: gamesover@planet.nl . 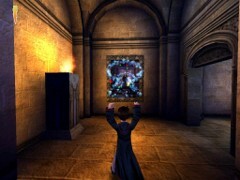 Find Professor Snape’s Potion classroom, located in the Dungeon. Find 2 secret Wizard Cards. Find 2 Secret Areas. 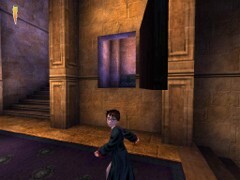 [3.8] Harry runs out of a door and enters the Second Floor Landing. Turn right and cast Flipendo thrice on the statue. Turn around and run from the stairs. 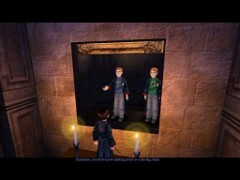 Cast Alohomora on the large mirror. Jump into this Secret Area and to the next ledge. Walk backward and automatically jump to the opposite lower ledge. Turn around and walk backward such that Harry will drop down to ground level. Continue right and cast Alohomora on the lock of the door. Careful: you’ll have to stun two Gnomes in there. Cast Alohomora on the chest and obtain a lot of BB Beans. Go out and climb the ledge on your left. Turn around and jump to the higher ledge. Repeat this twice and come out of the mirror. Turn left and right behind the corner cast Flipendo on a jar. 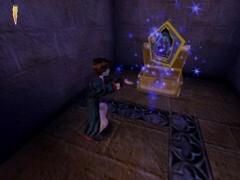 Take out the Bean and return upstairs to the statue Harry just charmed. 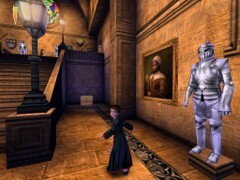 Continue left of the statue and ascend the stairs. On top of them turn right and cast Alohomora on the painting. Have you collected 25 Beans? Jump on the table with the candles and approach Fred. Nice work Harry, you found all the Beans we needed for now. Here is a Wizard Card, then. Hope you don’t have this one, yet. Remember, you don’t know anything about us collecting Beans. It’ll be our secret, right? The painting secures again and the Twins disappear. Harry is left behind with his Wizard Card #62: Ignatia Wildsmith, 1227-1320. The Witch who invented Floo powder. 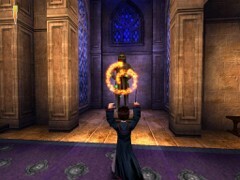 Continue left and go down the stairs; turn right and cast Flipendo four times on the Witch statue. Turn around, down the stairs and on your left there is another jar to break with Flipendo. 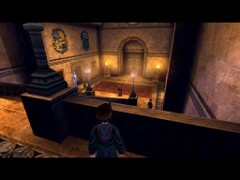 Proceed to the armors and Ron will run down the Monumental Staircase. First cast Flipendo on each of the armors. You may go on casting Flipendo on these tin guys forever, but only the first shot will shake a Bean out of them. Go down the Monumental Staircase and immediately turn around left and spot a chest in the corner. It wasn’t there before! 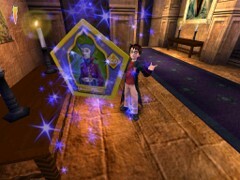 Cast Alohomora on the chest and obtain your Wizard Card #57: Gifford Ollerton, 1390-1441. Famous giant-slayer. Killed the giant Hengist of Upper-Barnton. 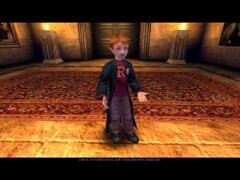 Proceed to the door where Ron went in: the one to the right of the Staircase. 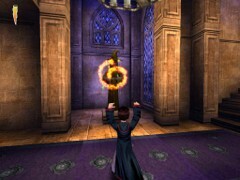 The door will open and Harry will run in.